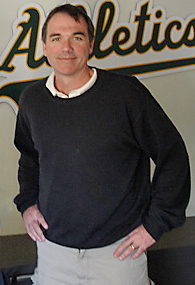 Billy Beane’s great 2012 year ended with him winning the Sporting News “Executive of the Year” in The MLB. He would really love a Playoff Series Win in 2013 for his young club. Beane has gambled so many times with trading Starting Pitching Veterans for 2-3 more pitchers – in hopes of 1 or 2 replacing the outgoing guy. After you see this Pitcher Roster Tree, you will be able to see how he has done. Beane has tailored his roster to playing in the confines of o.co Coliseum. Pitcher: Relief or Starter, Age, 2012 Year with W-L ERA and any significant stat/Transactions in reverse from trades, all players in the tree will be separated by semicolons: These players are currently on the A’s Depth Chart! #1 Starter – Brett Anderson 1. Traded with Dana Eveland, Carlos Gonzalez, Brett Anderson, Aaron Cunningham and Greg Smith By Arizona for Dan Haren, Connor Robertson: 2. Mark Mulder drafted by the Oakland A’s in 1998. Mulder went 22-18 with a 5.04 ERA for the Cardinals, while Anderson is already 25-25 with a 3.57 ERA. In this whole train of transactions, the A’s end up with Brett Anderson, Daric Barton, Eric Sogard, Chris Carter, Michael Taylor and (Shane Peterson with AAA Sacramento), plus only lost Huston Street and Mark Mulder for it (and Connor Robertson-Minors), as pieces of the initial Mulder deal, (Dan Haren) were used to acquire Carlos Gonzalez. Gonzalez was used to acquire Holliday as the main piece. Brett Wallace was the main part coming back from Holliday in the St. Louis trade, and he was later flipped for Michael Taylor from the Blue Jays. The A’s have 5 players on the current 40 Man roster to claim for this cycle of events and Shane Peterson in the Minors (Part of the Cards trade to acquire Holliday. Holliday was never going to sign long-term with the A’s. This chain of trades is wickedly awesome! Greg Smith is playing AAA with the LAA. Wallace was traded for Anthony Gose for the Blue Jays. Dana Eveland is a Free Agent in 2013 after throwing 32 IP for the Orioles in 2012. Huston Street was traded by the Rockies to the Padres for cash, and is a decent closer in the NL (2012 year 2-1, 23 Saves and a 1.85 ERA in 39 IP.) I take the 6 for 3 deal any day of the week. Mulder hasn’t played since 2008. Taylor still has time to mash the ball. Street was taken in the 2004 Draft as a Sandwich Round pick for losing Miguel Tejada to the Baltimore Orioles in FA. #2 Starter- Jarrod Parker (24) 13-8 3.47 ERA: 1. Cowgill was traded with Ryan Cook and Jarrod Parker for Trevor Cahill, Craig Breslow and cash. 2. Breslow was picked off of waives by the A’s from the Minnesota Twins for no compensation. 3. Cahill was drafted by the A’s in the 2nd round of the 2006 Amateur Draft. So right now it is still a trade to be analyzed. #3 Starter – Tommy Milone (25 ) 13-10 3.73 ERA: 1. Gio Gonzalez was traded with Robert Gilliam to Arizona for P Tommy Milone, C Derek Norris and Brad Peacock. So essentially you have Reddick, Kottaras, Norris, Milone and A.J. Cole (Minors A+) all traded for Andrew Bailey, Nick Swisher and Robert Gilliam (8th round Draft of Oakland A’s 2009 year). This is one is a pretty fair deal if you ask me. Please see this trade reactor on the hitter’s side under Josh Reddick here. Kottaras was recently plucked off of waivers by the Kansas City Royals. Peacock was used with Chris Carter, plus Max Strassi (4th RD draft Pick in 2009 Draft) – in order to acquire Jed Lowrie and Fernando Rodriguez. A.J. Cole was used with Ian Krol (7th Rd Draft Pick in 2009 by A’s) and Pitcher Blake Treinen (7th Rd Draft Pick in 2011 Draft) in a 3 way deal to acquire new A’s Catcher John Jaso. #4 Starter – A.J. Griffin (24) 7-1 3.06 ERA: Griffin was drafted in the 13th Round of the 2010 Amateur Draft. Bartolo Colon was 10-9 with a 3.43 ERA for the year in 2012 before being suspended for PED use. Beane has risked 3 Million Dollars on a 1 YR Deal for the 38 year old. How much will he give the A’s in 2013? Photo Courtesy of ESPN.com. #5 Starter – Bartolo Colon (39) 10-9 3.43 ERA: Signed as a Free Agent before the 2012 year ( 1 YR/2 Million) – and now the 2013 year (1 YR/3 Million.) No compensation needed. 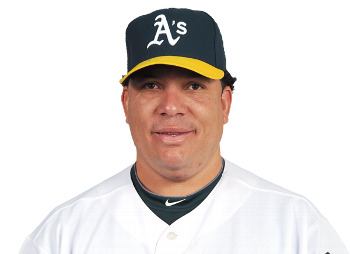 Colon will be re-eligible to join the A’s on April 6th (finishing out his suspension from last year). 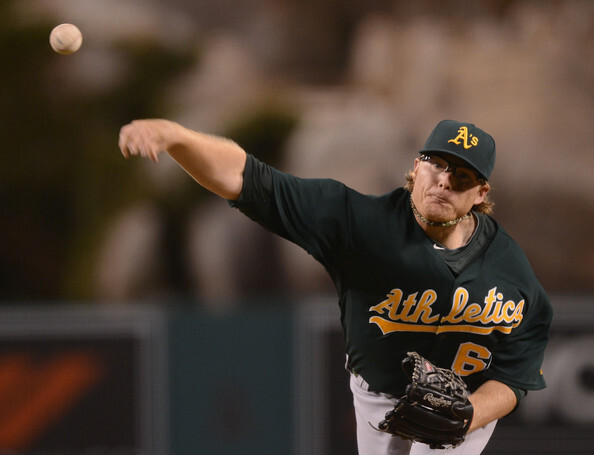 #6 Starter – Dan Straily (24) 2-1 3.89 ERA in 7 Starts : Straily was drafted in the 24th Round of the 2009 Amateur Draft by the Athletics. He made his debut in August of 2012 and may see some action as a starter or reliever in 2013. #7 Starter – Travis Blackley (30) 6-4 3.86 ERA: Blackley was selected off of Waivers by the Athletics from the San Francisco Giants in May of 2012. Nice little move for Beane for a #5 starter or extra relief guy. The man from Australia will probably see most of his time in the Bullpen, but is a good swing guy. the 35 year old native of South Wales just made his Spring Training Debut on Mar.21st. Last year Balfour was 5th in the AL in Appearances and notched 24 Saves to take over the role as the Closer..
Ryan Cook (25) 6-2 2.09 ERA 14 Saves, 71 Games, 73.1 IP and 80 SO: Again look to the Jarrod Parker listing here. This trade is yet to be analyzed to the fullest extent, however when you add Cook with Parker, it is looking favorably for Oakland so far. Cahill went 13-12 with a 3.78 ERA in his 1st year with the D’Backs. Sort of similar to Parker. Breslow was a waiver wire pick up for Beane off of Minnesota. 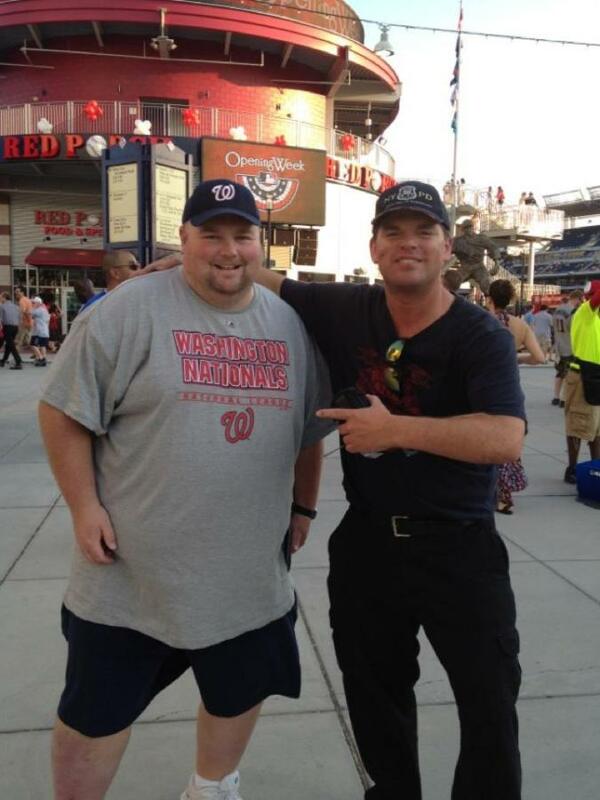 He was traded by Arizona to Boston for Matt Albers. Cook is one of the better late inning relievers in all of Baseball. Bravo Mr. Beane. Jerry Blevins (29) 5-1 2.48 ERA in 63 Games and 65.1 IP: 1. Blevins was acquired in a trade with the Cubs along with Rob Bowen (Released by the A’s and never signed by anyone else) for Jason Kendall. 2. Kendall was acquired from the Pirates and cash for Mark Redman and Arthur Rhodes. Evan Scribner (27) 2-0 2.55 ERA, 30 Games, 35.1 IP, 13 GF and 30 SO: Scribner was plucked off of Waivers from the Padres at the end of the 2011 year. He did not allow a baserunner in the 2.0 IP – of Game #5 during the ALDS versus the Tigers. Pedro Figueroa (27) 0-0 3.32 ERA, 6 GF, 19 Games, 21.2 IP and 16 SO: Figueroa was signed as an Amateur Free Agent in 2003 by the franchise. The Athletics will need to have carry years out of their bullpen horses again. 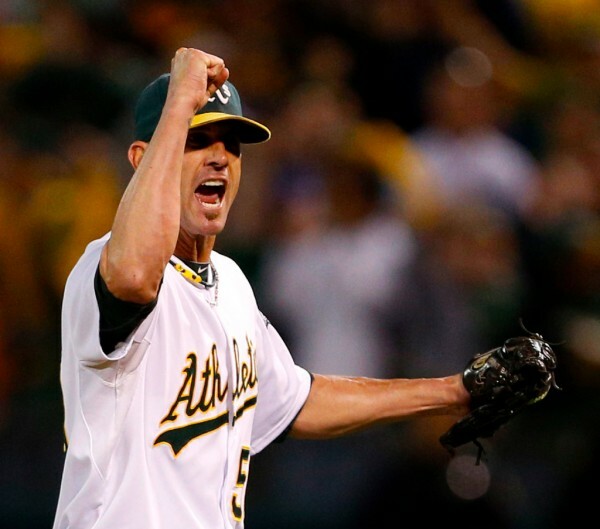 Grant Balfour is on the last year of his deal and will look to have a strong campaign. Facing the Angels and the Rangers a lot, the Athletics will need to keep working over game plans with their young pitchers. They are a good home club. In 2012, they won with a bunch of walk-off hits. In order to do that, it meant the pitchers were doing their portion in those tops of the Innings. Besides excellent drafting, a lot of the great valued trades and transactions have been pulled from Free Agency and Waiver Wire Deals from Beane, where no compensation has gone the other way. 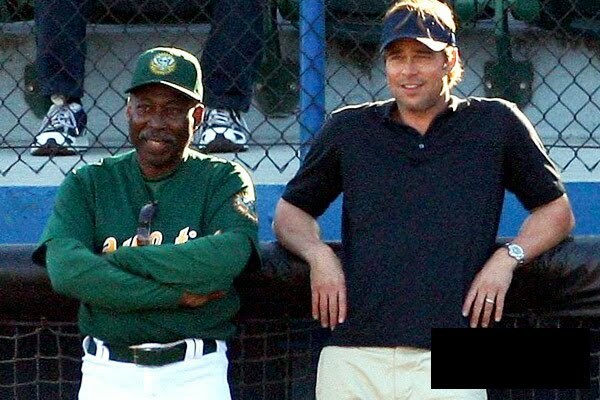 Hollywood should truly consider making a sequel to the Moneyball movie with last years version of the club. The team erased a 13 and a half game deficit to the Texas Rangers – and were the best team in the MLB for the last half of the year. The pitching was a colossal factor. The Staff only stands to make around $20 Million Dollars in 2013, while Bartolo Colon (SP) – $3 MIL , Brett Anderson (SP) $5.75 MIL and Grant Balfour (CL) $4.5 MIL will earn $13.25 MIL between them. That leaves about 8 other chuckers making roughly a $1 MIL each. Posted on March 24, 2013, in MLB Payroll and Contracts, MLB Teams: Articles and Analysis, The Rest: Everything Baseball and tagged 2012 ALDS, @chuckbooth3024, A.J cole, A.J. Griffin, a.j. Kirby-Jones, aaron cunningham, American league, andrew werner, andy parrino, arizona diamondbacks, barry zito, bartolo colon, billy beane, boston, brad peacock, brad ziegler, brandon mccarthy, brett anderson, brett wallace, carlos gonzalez, chris carter, Chuck Booth, collin cowgill, colorado rockies, connor robertson, craig breslow, dan haren, dan straily, dana eveland, daric barton, derek norris, detroit tigers, eric sogard, evan scribner, george kottaras, gio gonzalez, graham godfrey, grant balfour, greg smith, jarrod parker, jason kendall, jerry blevins, jesse chavez, josh reddick, Marco scutaro, mark Mulder, matt albers, michael taylor, Miguel Tejada, minnesota twins, MLB Amateur Draft, money ball the movie, national league, o.co coliseum, oakland athletics, orioles, pat neshek, pedro figueroa, pirates, rob bowen, robert gillam, ryan cook, san diego padres, san francisco giants, sean doolittle, st louis cardinals, the fastest 30 ballgames, tommy milone, toronto blue jays, Travis Blackley, travis buck, trevor cahill, tyson ross. Bookmark the permalink. Leave a comment.